Graduate from any recognized university and gainfully employed in Central Govt/ Semi Govt/ Private Sector/ Self Employed. Candidates whose application forms are found correct will be called for written exam and interview by a Preliminary Interview Board (PIB) at the respective TA Group Headquarters. Candidates selected by PIB are required to carry essential documents with attested copies at the time of interview. Thereafter, successful candidates will further undergo a Service Selection Board (SSB) and Medical Board for final selection. Candidates will have to pay Rs.200/- as application fee. 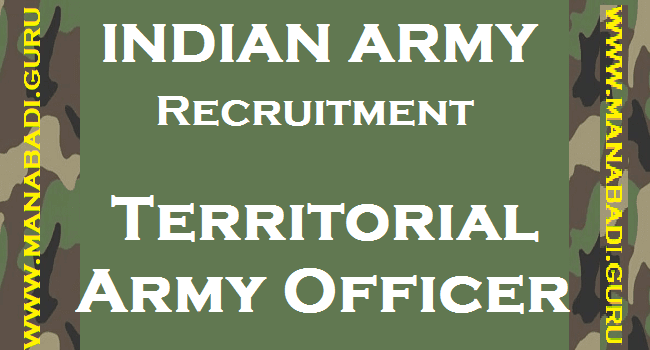 Eligible and desirous candidates can apply for Territorial Army Officer Recruitment Online through the website www.joinindianarmy.nic.in from 01 June 2017 to 30 June 2017. After submission of online application take the print out of application form for record/reference. The printout of the application form is not required to send to the TA Group Headquarter. Candidates are advised to go through the official recruitment notice by downloading from the link provided below.